The CAO flavours series treats your palate to a refreshing array of flavors and aromas. 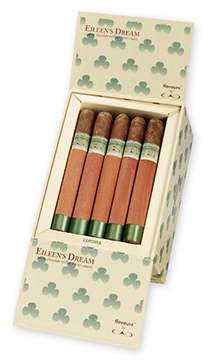 These flavored cigars are unique blends handcrafted with the same painstaking approach CAO takes with all of their premium cigars, so you won't be disappointed. Ideal for cigar enthusiasts of any kind, CAO flavours are the perfect choice for an everyday cigar or as an enjoyable change of pace from non-flavored smokes. The CAO Bella Vanilla utilizes only the highest quality vanilla beans found in Madagascar, recognized as the finest source for vanilla in the world. 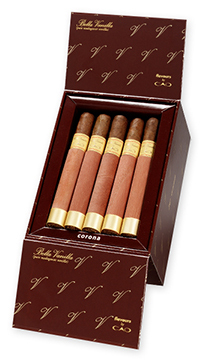 The complex flavors of these delicate, exquisite vanilla beans are imbued into a blend of rich Cuban seed tobaccos. CAO's goal is to deliver gourmet level purity combined with superior flavor. The result is a subtle, well-balanced cigar that yields a rich and layered complexity of flavor with an intoxicating aroma. 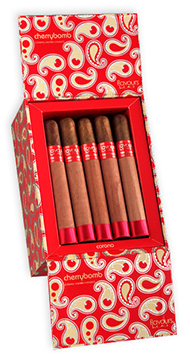 CAO's Cherrybomb cigarillos and cigars are constructed from a Cameroon wrapper and Dominican binder and filler. Ignite a CAO Cherrybomb and experience its intricate explosion of premium flavors - cherry and black currant mellowed by a core of creamy vanilla. With a complexity that's unique among the best flavored cigars and a rich, memorable aroma, this is one smoke you won't soon forget. Eileen's Dream is a combination of Irish Cream and white chocolate truffles. Superior Irish Whiskey, frothed cream, and coconut milk composes the Irish Cream. The delicacy of white chocolate truffles is a subtle mixture of hazelnut paste, white chocolate, ground almonds, cocoa, and vanilla extracts. 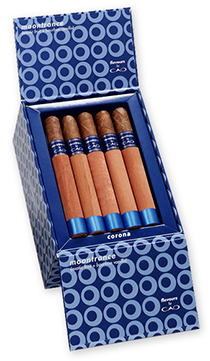 This avalanche of flavours is infused into a cigar with Grade One Cameroon wrapper and mild Dominican fillers to complete this five-star smoke. The CAO Moontrance is an intricate and unique blend of 100% all natural exotic fruit and bourbon vanilla extracts. Bourbon vanilla, a type of vanilla bean renowned for its caramel-like sweetness is married with ripe Georgia peach nectar and then mixed with other organic fruits. A splash of white honey from Hawaii is added, chosen for its tropical essence. This well-rounded blend is complimented with an exquisite blend of mild and rich tobaccos featuring CAO's Grade One Cameroon wrapper.